THIS WORKSHOP IS In two languages: English and Portuguese. 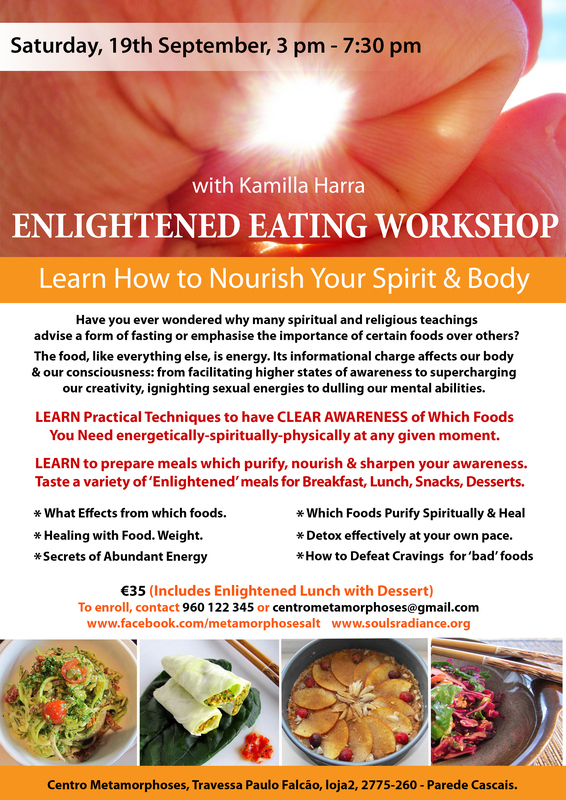 This workshop is dedicated to the intricate energetic nature of all we consider ‘food’ and its profound effects on our spiritual, mental, emotional and physiological states of being. The food we eat, like everything else, is energy and its informational charge can affect not only our biochemistry but our consciousness in many different ways: from interrupting higher awareness processes to facilitating access to higher states of being, from dulling our creative and/or sexual energies to supercharging up our mental creativity. Discover which foods are known to have these and other effects on human beings, and why they are not necessarily the same for everyone at every stage of one’s evolution. Learn a practical technique which allows to ascertain for yourself what are the most beneficial foods for you (at all levels of your body-energy-consciousness system). As our energies, cycles and ways of being change weekly, daily and hourly – our requirements for food (or no food) change and evolve also. Kamilla will guide you to experience for yourself how to ‘get’ what you need nutritionally on all levels of your being at any particular time. Taste and enjoy the harmonising ‘Vitality Soup’, ‘Miracle Icecream’, ‘Chocolates’, ‘Energy Pudding’ (can be used for breakfast), and smoothies prepared by Kamilla based on your current energy need: either to balance yin or yang energies. You will be shown how to find out which one you need. Have you ever wondered why many spiritual and religious teachings advise a form of fasting or emphasise the importance of certain foods over others? Perhaps you had experiences of extreme mental clarity or even extra sensory abilities whilst eating or drinking differently, during a detox or a fast? Ancient civilisations, the Old Testament and other scriptures mention some sacred foods and peoples who ate differently to the ‘common folk’. The mysterious ‘Pulse’ is one such food – said to be giving men triple strength, stamina, agility and mental capacities, the ‘conscious eaters’ of today prove that the ‘now decoded’ mysterious Pulse truly does produce quite amazing effects in the body when eaten the way it has been described in the scriptures. Come and explorer the techniques which will guide you to balance or heal your whole body-spirit system through consciousness and food.